The Fuller Center Bicycle Adventure’s main purpose is to raise awareness about and money for The Fuller Center’s work of building and repairing homes across the United States and around the world in partnership with families in need. When the Bicycle Adventure meets its 2016 goal of raising at least $200,000, it will have raised more than $1.5 million since its first ride in 2008. 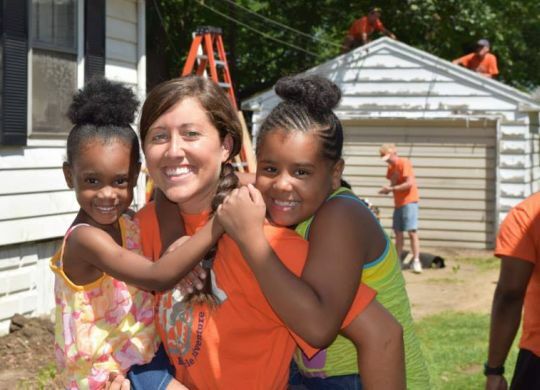 Bicycle Adventurers have the added bonus on their rides of build days in which they work with Fuller Center covenant partners across the nation to experience firsthand how the ministry lifts families. Thanks to financial support from the North American Retail Hardware Association and Stanley Black & Decker, the Bicycle Adventure can now plan seven such build days during its 2016 summer ride from Seattle, Wash., to Washington, D.C. The NRHA is providing $1,000 grants for each build day ($7,000 total), while Stanley Black & Decker is giving an additional $500 for each build day ($3,500 total). The money will be used by Fuller Center covenant partners to purchase materials and supplies from their local retailers for each project. Greg Woith, who leads the Illinois Valley Fuller Center for Housing, said that the grants make such build days possible. He added that such build days have impact well beyond the actual home repairs performed by the cyclists. “First and foremost we were able to make significant home repairs for a Vietnam Veteran,” Woith said. “We also received a Proclamation from the Peoria mayor and City Council proclaiming our work day ‘Fuller Center Home Repair Day’ in Peoria. The NRHA grant enabled us to purchase all the materials and some tools for the roofing project at locally owned businesses, something that was noted in the city proclamation.